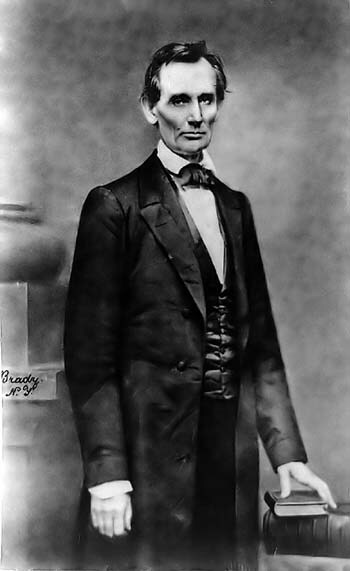 One of Mr. Lincoln's greatest speeches was given on February 27, 1860 at the Cooper Institute in New York. Lincoln, who had yet to announce his intentions to run for president drew a crowd of over 1,500 people. Lincoln's speech electrified the crowd, and helped elevate the Nation's awareness of him. One eyewitness to the speech that evening said, "When Lincoln rose to speak, I was greatly disappointed. He was tall, tall, - oh, how tall! and so angular and awkward that I had, for an instant, a feeling of pity for so ungainly a man." However, once Lincoln warmed up, "his face lighted up as with an inward fire; the whole man was transfigured. I forgot his clothes, his personal appearance, and his individual peculiarities. Presently, forgetting myself, I was on my feet like the rest, yelling like a wild Indian, cheering this wonderful man." This speech was doubtless one of Lincoln's most inspiring, and helped establish him as a man of prominence on the national stage.